Have you played Junk Canyon Claw and reached the bottom of the pit? If you're good enough you will get to retrieve a blue capsule and it has an item you might find very useful or perfect for customizing your RIDE or Avatar. However, you will have to make it back to the surface if you want to be able to make use of it. When prompted to choose to continue or quit, I usually choose quit whenever I manage to take the blue capsule with me. If you get the blue capsule you'll have to wait the next day for another one to appear at the bottom of the pit. 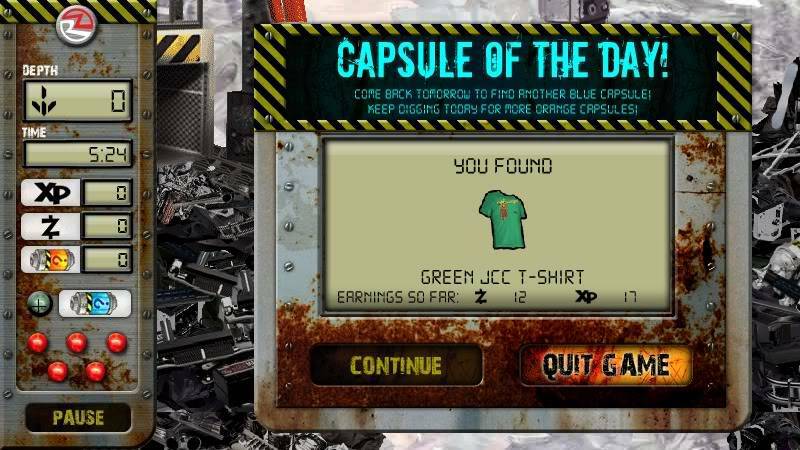 The second time you reach the bottom on the same day, you will find a regular yellow capsule. The layout of the pit is random and it can get tough as you get near the bottom of the pit. Tip: Do not get all the repair items, try to keep some available specially in tricky places. Prepare to sacrifice hit points on narrow passageways with lizards that is equipped with a magnet! "JCC" is very challenging and requires some patience and anticipation. Do not rush in when you see buckz or XP items. Only get them if you have enough space to navigate on. haha nice.. i got a spoiler too but a different one.. i got to take screenshots next time. i usually just get clothez..
Get your Exclusive Junk Canyon Claw shirt now before it randomly disappears into the pit again! Thanks for the heads-up bro! I got my JCC shirt! Thanx so much for the tipz!! !